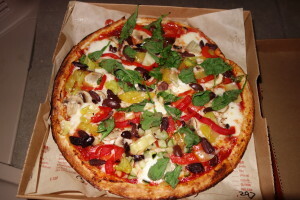 Last night we tried Blaze Pizza as part of a middle school fundraiser. It was our first visit to this spot at Mohawk Commons, part of what used to be the Barnes & Noble store (RIP, may we hold it and our beautiful memories in our hearts forever). Full disclosure: we, as a family, are pretty fussy about pizza. We generally prefer to make our own pizza at home. Take-out just usually isn’t all that terrific, and it always feels brutally unhealthful. We like fresh mozzarella better than regular, and J likes artichokes on her pizza, which you can’t always get. Before we visited Blaze, one person had told me that it was awesome and someone else insisted that it was terrible. I knew that the place would be packed with fellow fundraisers, but it’s infrequent that one can feel virtuous about buying take-out, so I was all in. 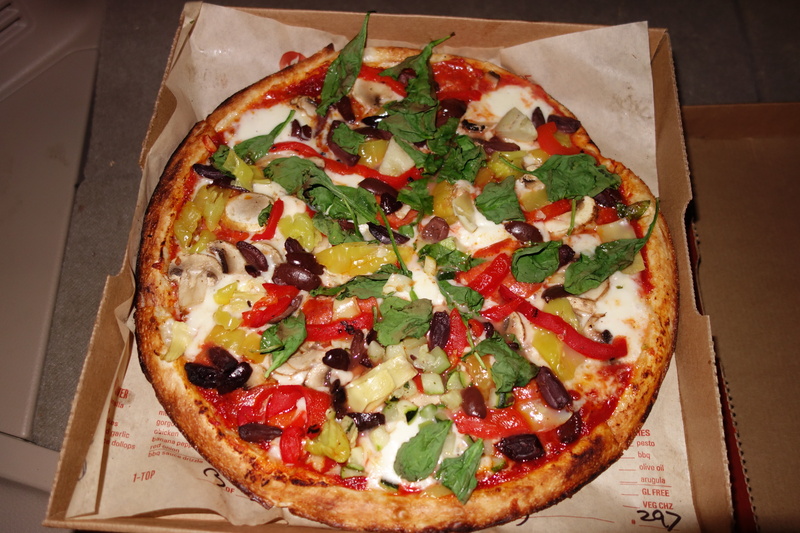 Blaze Pizza is part of the recent trend of fast-casual, quasi-healthful, hipster-vibe restaurants. With the “build your own” pizza, you talk your way through your order like at Chipotle, and perhaps the very best part is that you’re not paying per topping. I ordered pizzas to go because J was at gymnastics and M was home studying for a math test, and we each got our own, enough for dinners and leftover lunches (Cute W was traveling for work). Now, the pizza ordering process itself was a little weird. For one thing, the first person to start you off takes your name and writes it on a little sheet that accompanies your pizza. More precisely, they write your name and an emoticon, like “Katie :)”. And when I saw that, the first thing that I thought was, “These youngsters do know, don’t they, that ‘:)’ is supposed to indicate a smiley-face?” A smiley-face is a little picture that cannot be typed in exactly with a standard keyboard, and so that’s why the little smiley-face shows up sideways. But an actual smiley-face, drawn with a marker, should have the eyes next to each other horizontally and above the smiley-face mouth. Like, that’s actually how people have been drawing smiley faces throughout recent history. I mean, don’t get me wrong. I’m not a facist, and if, from birth or because of an accident of some kind, your face happens to be arranged in a way that’s more like, say, a Picasso painting, and you wanted to replicate such an atypical arrangement in marker, I fully support that. But I’d suggest that at least 9 out of 10 people who enter the Blaze pizza establishment have eyes located above their mouth, and indicating this with a marker is quite simple. So the sideways smile ends up more like: *wink, wink* it’s almost like I’m smiling, but in a vaguely corporate-hipster way. Oh, yeah, some of you may think I’m making too much of this. But if I didn’t, I would have to stop writing and go take a shower, fold laundry, or answer work emails. So I’ll carry on. Also, having established that my name is Katie, every single staff member used my name so much that it became awkward. It’s always funny, I think, to go into a new establishment with tons of new staff, because they are so recently trained, thus terrific at following exact procedures as directed. They just got this gig, and the franchise owner just finished all sorts of professional development seminars, and so the staff are at top-form. 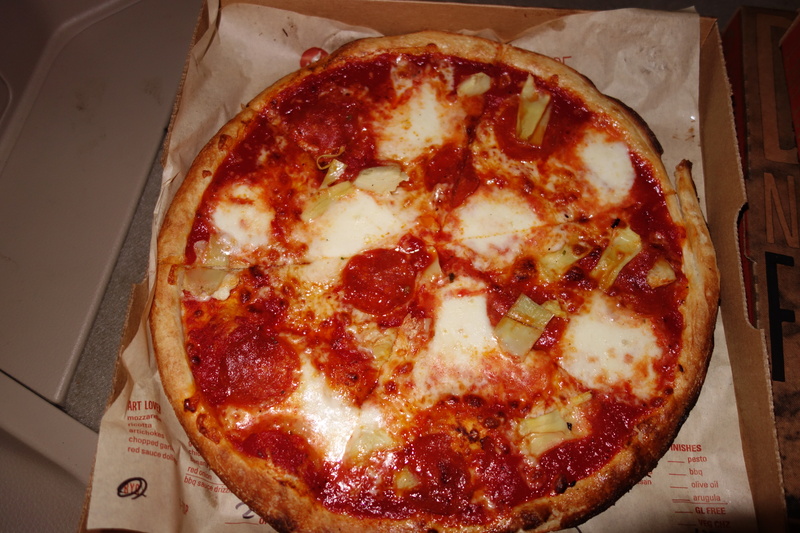 At Blaze Pizza, top form means saying people’s names all the freaking time. Now we’ve all heard that people like to hear their own names, and they take that crap seriously at Blaze. So, the script is something like, “So Katie, I’ve put the classic red sauce on, Katie, what cheese would you like, Katie?” and “Katie, here’s pizza #2 for you, Katie.” And if, like me, you start to giggle when you’ve heard your name for the 13th or 14th time in three minutes, and you snicker every time it’s mentioned thereafter, it can make the ordering process somewhat challenging. And finally, I take exception to the slogan “Fast Fire’d.” Why is there an apostrophe there? Don’t they know that an apostrophe indicates that a letter or letters are missing? No letters are missing! They are turning the word “fire” into a past participle used as an adjective to indicate that the pizzas that they are serving were exposed to fire. Quickly. And, okay, someone could potentially make the argument that they took the word “fire” and added the “ed” to put it into the past form, but they didn’t want to spell it fireed, so they called it “fire’d.” But that’s just unnecessary, because it is standard grammatical/spelling practice to only add a “d” when the verb that you’d like to express in past tense already ends with an “e” (see, for example, bored, irritated, stoned). So adding an apostrophe is about as unnecessary as drawing a smiley-face sideways in marker. But, really, I am just giving them a hard time. The staff were delightful and friendly, and they didn’t do anything irritating like wipe their nose before picking up a handful of cheese or using a dirty broom to sweep out cobwebs over where the meat is being cooked (I’m lookin’ at you, Clifton Park Chipotle!). So, anyway. . . .
J’s pizza had classic red sauce, regular and fresh mozzarella, pepperoni, and artichoke hearts. I didn’t bother with a picture of M’s pizza because it was pretty basic–just sausage on top. Mine, however, was a vision of loveliness: half classic red sauce, half spicy red sauce, regular and fresh mozzarella, pepperoni, artichokes, banana peppers, mushrooms, red peppers, kalamata olives, spinach & zucchini. I was super-psyched to have the kalamata olives as well as regular black olives. I walked in thinking that I’d throw on sauteed onions and roasted garlic, but in person the onions looked potentially slimy and the garlic just seemed like too much of a mouthful. And I just forgot about the arugula–sad! I added the zucchini because, hey, it’s another vegetable, but I don’t think it really added or detracted to my overall pizza-joy. I meant to compare and contrast the regular vs. spicy sauce, but it was tough for me to gauge which was which. I think that the spicy sauce wasn’t particularly spicy, but the effect is cumulative, so if my entire pizza had been spicy sauce, it might have been a bit too much for me. I loved having the fresh mozzarella option, but I was so busy figuring this out (they used the term “ovalini,” which was wholly unfamiliar to me) that I neglected the Parmesan. Since Cute W was not with me and I love-love-love him, I was mentally planning his pizza, which I believe should include Gorgonzola and bacon. In short, there are many, many options, and if that’s overwhelming to you, you can check out the Signature Pizzas. The verdict? M thought it was awesome. The crust was lackluster and falling-apart thin at the center, but I loved the toppings enough that I didn’t mind that they felt like they were piled onto an edible paper plate. Still, the benefit of the super-thin crust–besides the fact that it makes for quick while-you-wait prep–is that it doesn’t make you feel nearly as bloated as you feel at the end of a second slice of your usual take-out pizza. And with all of those veggies piled on, you could almost convince yourself that it’s pretty good for you. When J came home, she pointed out that it was much more like our homemade pizza than any pizza we buy at other places, and I realized that she was right. Except, of course, our crust is better. If you are a pizza person who prioritizes crust, this is not your place. But for freshness and topping varieties, it’s pretty dang delicious.